ODE TO THE SUNFLOWER SEED – The Mightiest Sprout of All! I was blessed to be able to go to Haiti last year a week after the earthquake to help at a Seven day Adventist hospital. 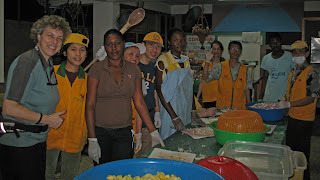 I was so touched to see people from all over the world that had temporary left what they were doing to lend a hand to the Haitian people in desperate time of need. The degree of strength (moral, physical, psychological), the resilience and grace I experienced while assisting Haitians patients was so humbling. We often complain about things that are not so important when placed in a larger context. It reminded me of something that happened when I first arrived. 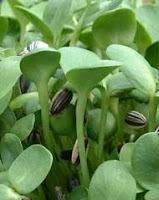 I had sprouted several kinds of seeds and my favorite of all, sunflower seeds. They take a little longer to germinate than smaller seeds and you have to remove the hulls after a few days but they are totally worth the extra effort. So I had prepared some that were ready to consume and filled an entire small ziploc bag. Finding fresh food while traveling isn’t obvious and I expected living on protein bars for the next few weeks. So I grabbed the bag right before leaving for the airport and threw it in my bag pack. I had a long trip ahead of me, 2 flights, 1 night lay over and a rough 8 hours bus ride across the border from the Dominican Republic to Port-au-Prince, my final destination. I grabbed a few handfuls while in the airport and threw the bag in my backpack and completely forgot about them until about 4 days after I got there. The bag of sprouts somehow ended up at the bottom of my backpack. I had to setup my tent, hit the ground running as soon as I got there. Now, imagine 90 to 95 degree heat, intense humidity, day and night. The kind of heat that gives you a skin rash just from wiping the sweat off your face so many times! Sunflower sprouts are so strong, full of life, that even after having spent 4-5 days in the heat, in the dark at the bottom of a backpack, not only were they still alive, but they were striving, growing, bright green. That’s pure life for you. They reminded me of the beautiful Haitian people. Strong, kind, patient, gracious and so resilient. If I was stranded somewhere, the one thing I would bring with me is a bag of raw sunflower seeds. As long as I can find some water, I am good to go. Sunflower seeds have a delicate flavor, a little peppery, slighthly salty but not too much. Never use roasted seeds! Those are dead beyond measure. Only use raw hulled sunflower seeds.They are super cheap in the bulk section of grocery stores. Raw seeds are basically dormant. So the first step is to soak them (1 cup) overnight preferably in filtered water (3-4 cups). Mix well to make sure all seeds are wet. This washes off the enzyme inhibitor and brings the dormant seeds to life. It also turns them into a nutritional powerhouse.That’s when the magic begins! It is virtually impossible to mess these up! You can sprout them in a sprouting bag or in a jar. I used clear glass jars and cut out some window screen for a lid. To secure the top, I use the ring from the lid without the middle section to keep it in place. It is cheap and can be reused many times. You will need to rinse them twice a day, in the morning and in the evening. I use a wooden dish rack to rest the jar at an angle. This helps draining the jar completely. Seeds will rot if they are not well drained. After 3 days, you need to remove the shells. If you leave them, they will spoil and your sprouts will spoil quickly. This process is a little time consuming but relaxing. I usually do it while watching TV. I use one bowl with water and another one empty. Hold the seed in one hand, squeeze the sides to gently remove the seedling without breaking it. This process will speed up the growth of our seeds. It is a little like birthing a new life, one seed at a time. I eat them by the handful, I also sprinkle them on top of salads. They don’t need anything really. If you are sprouting for the first time, start with mung beans (impossible to not to sprout), garbanzo beans, lentils, and of course our champion, sunflowers. Storing the sprouts: They store best in your refrigerator if they are dry to the touch. So wait a few hours after the last rinse to refrigerate them. They can keep up to 2 weeks but it is better to sprout more often. It is so cool to do this in the winter when little grows in the garden. Taking care of your sprouting equipment: it is important to disinfect the jars in between sprouting because sprouts can rot if any mold is left in the jar. Since I am not big on chlorine, I use pure cider vinegar. I scrub it with a toothbrush then rince the jar well to remove everything and let it dry upside down. Dry seed storage: Seeds will last a long time if properly stored. You need a cool, Dry and Dark place. Seeds shelf life can be increase 4-5 times by freezing or at least double by refrigerating them. Not bad for a tiny seed.